Fall may be in full swing, but this past weekend we had one more summer fling in the form of a party and runway show in honor of Sjobeck at LIVE! On Sunset. Our store was made California-cool with beachy-keen touches like a giant beachball, sand runway, and live music by beach boys cover band, The Beach Toys. The Spring 2010 collection stayed true to Sjobeck’s Malibu-roots. Both men’s and womenswear were breezy, cool pieces like maxi dresses, linen shorts, and adorable track-style hoodies. 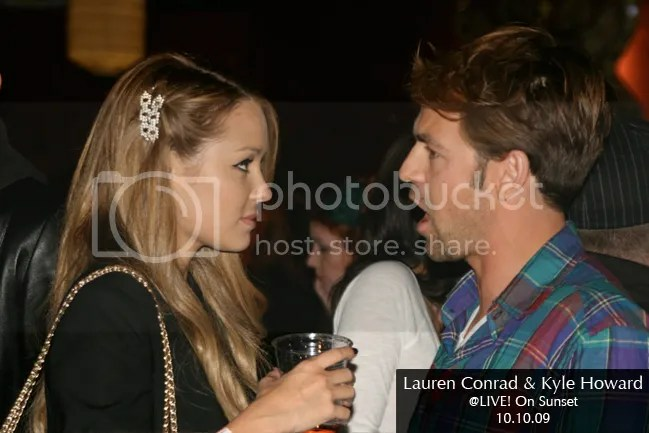 Spotted in the crowd enjoying the show was native California girl, Lauren Conrad, and her boyfriend actor Kyle Howard (above). LIVE! On Sunset is at Project Las Vegas and while here we checked in with some of our favorite brands including Superdry, Rerock, Dylan George, and Kitson LA. Project is a wholesale show for contemporary and premium denim brands that takes place on September 1st, 2nd, and 3rd in Las Vegas. While at the show placed orders for Spring Summer 2010. However, before we get in spring looks, we still have fall and winter to look forward to from all of these great lines. Jazmin Whitley celebrated the premiere of her new MTV show House of Jazmin last week at LIVE! On Sunset. The new MTV series focuses on Whitley and her hectic life as a fashion designer, co-starring her best friend Morgan, mother Susan and little brother Joey. The new show is already receiving plenty of support as shown by the great rating it recently received in newest issue of US Weekly and a full house of fans that came to the fantastic premiere event. Attendees included Miss California Tami Farrell and Diddy’s StarMaker cast Marisha Shipp and Monet Monico, as well as old school 90210 cast member Ian Ziering , Chudney Ross, and Prodigal Sunn. We’re shooting some new men’s looks today including clothes from Superdry, Gypse 05, John Varvatos, Takel, Rxmance. As apart of the shoot, we have a new men’s web model, Michael, and a new photographer, Christian. Look for the new additions to the site, which will be up by then end of next week. Q: What’s your history as a photographer? A: I shoot musicians, actors, and fashion. Came form New York, I have been in LA for three years. When I first got here I shot for wire image and also while out here I have been doing a lot of personal work. When I went from film to digital, about six years ago, I took about a 4 year hiatus to get used to the idea of digital. Q: What your favorite item in store? A. I like the shoes, which is surprising since I’m not a shoe guy. I am however trying to get more into shoes. I’m pretty hard on clothes. If you buy me a shirt later that afternoon I may be gardening in it. Actually, the shirt I’m wearing today I caught on fire the first time I wore it while camping. Q: How do you describe your personal style? Does it differ when you’re working? A: I go from ghetto urban cowboy, to eurotrash, to pajama party. When I’m working I try to wear something as comfortable as possible. I also like to work barefoot. Q: What’s your personal style? A: Pretty urban, but also really basic, I’m a Levi’s and white v-neck kinda guy. Q: What’s your favorite item in store? A: I will probably be purchasing the Block headwear Raffia fedora at the end of the day. Q: What’s your take on accessories? Q: How long have you been modeling? And what’s the biggest gig you’ve had? A: I’ve been modeling a little over a year. The biggest gig was Macy’s- I modeled Ray Bans for them, which actually was their last campaign out of Seattle. Monday July 27th at LIVE! On Sunset! Go to www.thegoodlifecasting.com to download an application. Everyone loves the good life—especially you! Maybe you live like a princess or maybe you only act like one; it matters not—point is, you deserve to be a princess! Whether you get pampered on some one else’s dime and your extravagant lifestyle includes luxury cars, designer handbags and expensive jewelry, or you’re tapping out your resources to do whatever it takes to maintain the image, you could be just the girl we’re looking for! In this new series, it’s all about you and your glamorous lifestyle. They are searching for the most outrageous, over-the top ladies who are living large! Maybe you were born with a silver spoon or maybe everyone only thinks you were—either way, you’re A-List, baby! And, it’s time everybody knows. • Is your closet full of designer clothes and shoes that would make Imelda cry? • Do you carry your teacup Maltese as an accessory? • Do you live in an amazing home with maids, a chef, a personal assistant or a driver? • Is your job an intense social calendar and your hobby shopping at Gucci? • Are you on the cutting edge of every trend and don’t miss a beat when it comes to Hollywood gossip? • Do you live a lifestyle everyone envies? Your parents or your boyfriend may think you’re over the top- but we get it! You don’t shop sales, you don’t let rules get in the way of a good time and you love champagne! Your friends want to be you and you want to be famous. And we want to help. Attitude is everything–let’s show the world what its like to be you! Buy a knock off? No way! Do your own laundry? Unthinkable! Pay your own way? We must be kidding! If this sounds like you, come meet our Casting Department in person! Last night LMFAO happily greeted their fans and sold cds, clothing and accessories from their line, Party Rock Clothing.